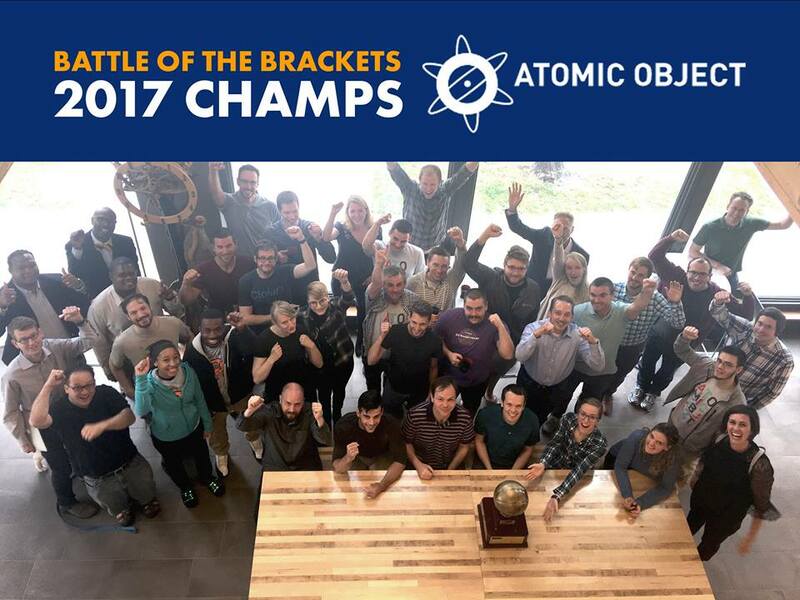 We support several charities and events at Atomic Object, but few are more fun than the annual Battle of the Brackets. If your business is looking a fun way to give back to the community, it’s not too late to join! Atomic won the inaugural event in 2017, and we’re looking to reclaim the trophy this year. Battle of the Brackets is a March Madness event benefitting the GR8 Sports, Great Kids program, which is run by the Grand Rapids Student Advancement Foundation (GRSAF). It gives financial support to Grand Rapids Public School (GRPS) students who couldn’t otherwise afford to play on sports teams. This year the program expects to fully fund 151 middle school teams across 15 sports. Your organization makes a $1,000 donation to GR8 Sports, Great Kids for the opportunity to participate in a men’s and women’s bracket competition. Then, all you need to do is set up a group and invite all of your coworkers. You can also jump in on the trash talk by visiting the event’s Facebook page. After every round, GR8 Sports will send out updated company standings. A single company score is taken from the average of all participants at that company. If your company wins, you get bragging rights and an awesome trophy to keep for a year. The personal benefits of athletics for students are well known. Studies suggest participating in athletics helps develop self-confidence and self-esteem. They’ve also been shown to improve communication skills and teamwork. Participating in sports also has an impact in the classroom. A study done by the Los Angeles Unified School District found that student athletes attend school more often and receive higher grades. According to GR8 Sports, Great Kids, GRPS middle school athletes score 7% higher on standardized tests. You can learn more at the GR8 Sports, Great Kids web page. As someone who has personally seen and felt the benefits of participating in athletics, I’m proud to lead Atomic’s effort for this cause. It’s in line with Atomic’s goal to make our communities a better place to live and it is a fun, easy way to provide support to kids that need it. So, if you’re interested in competing against Atomic to help raise money for local students or if you’re looking for other ways to get involved with GR8 Sports, Great Kids, please reach out to Cara Jones at GRSAF or visit their Facebook page.